They are called as dental bridges because they bridge the gap created by one or more missing teeth. It is made up of two or more crowns for the teeth on either side of the gap, these two or more anchoring teeth are called abutment teeth and a false tooth in between. The false teeth are called as pontics and can be made from gold, alloys, porcelain, or a combination of these materials. You can bite and chew properly. Traditional Bridges: They are made of either porcelain fused to metal or ceramics and are the very common type of bridges. 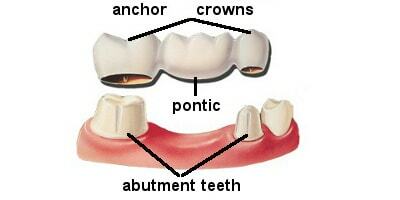 It involves creating a crown for the tooth or implant on either side of the missing tooth, with pontic in between. Cantilever Bridges: They are used where there are adjacent teeth on only one side of the missing tooth or teeth. They are not recommended in the back of the mouth where it can put too much force on other teeth and damage them. Maryland bonded Bridges: They are also called as the Resin-bonded Bridge and are made up of porcelain, porcelain fused to metal, or plastic teeth and gums supported by a metal or porcelain framework. How Are Dental Bridges Prepared? During the first visit to the dentist, the abutment teeth are prepared. It involves recontouring these teeth by removing a portion of enamel to allow room for a crown to be placed over them. Then impressions of the teeth are made, which serve as a model from which the bridge, pontic, and crowns will be made by a dental lab. The dentist will make a temporary bridge to wear to protect the exposed teeth and gums. In the second visit, the temporary bridges are removed and the new porcelain or metal bridge are checked and attached. Dental bridges can be used for five to 15 years and even longer. How to take care of Dental Bridges? Brush your teeth twice a day and floss your bridges daily to prevent tooth decay and gum disease. Eat a balanced diet for proper nutrition.